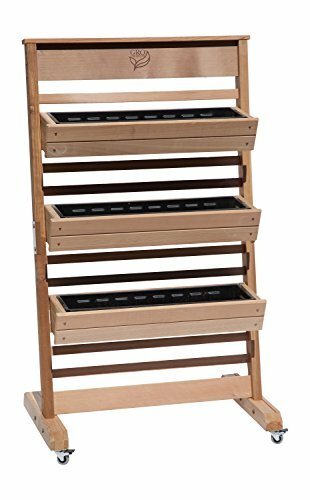 The GRO Products Vertical GRO System may have a small footprint, yet it will change the way you garden in a big way. The VGS is quick and easy to assemble-it only takes a few minutes. The VGS is constructed right here in the USA with Western Red Cedar, a naturally rot and insect resistant material. The kit includes 3 removable 30-inch-wide planter boxes that can be adjusted on the VGS to accommodate different plant heights. Included with each VG Box are removable, heavy duty plastic liners that provide a barrier between the soil and cedar. And here's a helpful hint: you can remove the plastic liners and conveniently plant them on your potting table. VGS's can be used either as a wall mounted or free standing unit. Cubic foot of soil needed: 1.5. VGS provides 7.5 linear feet by 6 Inch wide planting space. 4 casters (wheels) and all assembly and mounting hardware are also included. Unit can comfortably accept 2 additional VGB-30 Planter Boxes or 2 additional VGB-9 Planter Box. Measures 36 by 58 Inch.